A perfect barbecue dish for summer evenings. Allow to cool a little, then cut the end off each garlic clove and squeeze the garlic flesh into a bowl. Add the paprika, olive oil salt and pepper to the bowl and mix well. 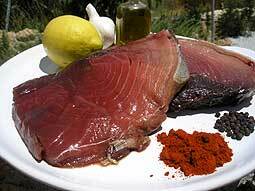 Place the tuna steaks into a shallow dish, pour over the above sauce and leave to marinade for about half an hour. Cook on a barbecue or grill for about 5-6 minutes each side.